The world's most acclaimed maker and purveyor of status goods, Hermès has evolved from its days supplying harnesses to coach builders. The firm has been in family hands since it was begun in 1837, when Thierry Hermès (1801-1878), who had moved to France from Prussia in 1821, established his wholesale business near the old city wall on the rue Basse du Rempart in Paris. In 1879 his son Émile-Charles Hermès (1835-1919) acquired the current flagship building at 24, rue du Faubourg Saint-Honoré and expanded the business into retailing by manufacturing and selling saddles along with related equestrian accoutrements. At the time the phrase "carriage trade" connoted the uppermost level of the haute monde: those who could afford to commission, equip, and maintain exquisite horse-drawn carriages, not to mention stables of purebred horses. Thus the Hermès clientele came to be composed of the upper crust of international society. Somewhat unusually for a company associated with the stately past, Hermès adapted astutely to a rapidly changing world as the early twentieth century witnessed enormous changes in modes of transportation. Émile-Maurice Hermès (1870-1951), understood that people's preferred methods of travel had increasingly become an expression of their personae and position in society. Thus the company developed luggage, folding portable furniture, and other articles made specifically for travel by ocean liner, airplane, safari, or automobile. Nor was the world of the horse ignored, as riding became even more glamorous as a sport than it had been as a means of transportation. Emile-Maurice's son-in-law Robert Dumas (1905-1978) was the next director of the company. Robert was succeeded by one of his sons, Jean-Louis Dumas (1938- ), who held the reins after 1978. Numerous Hermès family members continued to be closely involved with the company, and the fact that it remained a family-run firm made all the difference in its continuing reputation for superb quality. At Hermès tradition and innovation were almost paradoxically intertwined; what might have seemed like mechanical precision was achieved by carefully nurtured and trained artisans working entirely by hand. Besides a level of quality against which all other quality goods were measured, Hermès came to be best known for several of its products that progressed from practical items to best-sellers to classics to cultural icons. 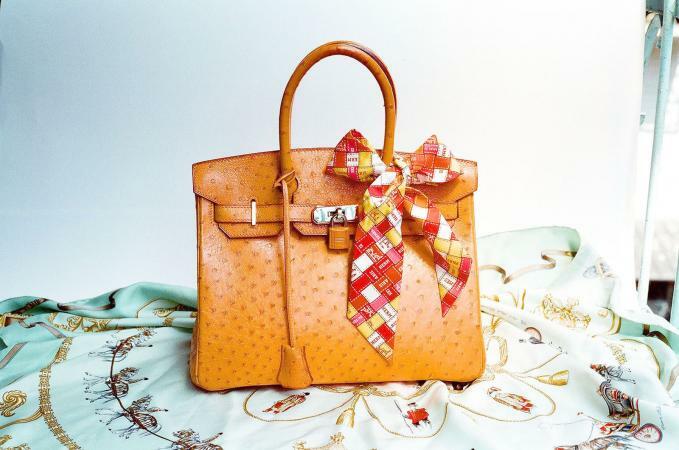 Few articles of women's attire carried the significance of a Hermès handbag in the early 2000s. The Hermès Kelly and Birkin bags entered modern consciousness as icons laden with status. As a plot element in Diane Johnson's novel Le Divorce, the Kelly bag was instantly recognizable to those conversant in the language of status and society as a sign that the American-in-Paris Isabel Walker had acquired a well-heeled older lover. And Martha Stewart's carrying two Birkin bags-not just a black bag but a brown one as well-received international attention at her 2004 trial and might have contributed to the distance the jurors perceived between her lifestyle and theirs. The haphazard path of the Kelly bag's journey to icon status was part of its appeal. Originally a large bag for holding a saddle when it was introduced around 1892, the prototype of the Kelly bag was known as the Haut à Courroies, indicating that it had a high handle. During the 1930s the Haut à Courroies joined the Mallette and Bollide as roomy Hermès travel bags. An early depiction in the July 1937 issue of the French high-fashion magazine Femina showed two women waiting as a curved aerodynamic train pulled into the station. Both women were dressed in typically chic travel clothes of the period-sober and tailored. One carried a light-colored Mallette bag; the other, a dark and soft rather than stiff Kelly bag in dark leather. Both handbags represented a departure from the dominant purse of the 1930s, which was a simple flat small envelope. The boxy Kelly bag got its nickname, famously, when Princess Grace of Monaco was shown on the cover of Life magazine in 1956 shielding her stomach with her handbag so as to ward off rumors (which would have been front-page news the world over) of her first pregnancy. In the 1950s Princess Grace was more than a fascinatingly beautiful style-setting woman; she was romance incarnate. She represented two types of American aristocracy-East Coast upper-class families and Hollywood celebrities-married to European royalty. Sales of the Kelly bag took off; it began to be used as a town bag, appropriate to wear with a tailored dress or suit. Thirty or so years later, Jean-Louis Dumas chanced to sit next to the actress Jane Birkin on an airplane. Dismayed by the unkempt appearance of her straw carry-all, Dumas asked Birkin if she would help develop a new tote for the company. The much-coveted result was introduced in 1984. Like the Kelly, the Birkin bag had its origins in the world of luggage. An early version of the bag had appeared in a 1963 advertisement on top of a stack of small Hermès suitcases. That women of the early twenty-first century required the equivalent of antique luggage to help contain a day's necessities spoke volumes about their lives having become more rather than less complicated. Many of the hundreds of Hermès handbags became classics, including Jacqueline Kennedy Onassis's favorites-the casual Trim, the more formal Constance with its large H-shaped clasp, and the Mangeoire, made like a horse's feed bucket with holes through which a scarf could be threaded. The Bollide, however, deserves special mention for its use of zippers. While in Canada during World War I, Émile-Maurice Hermès was intrigued by the sliding fastener used to close the top of his Cadillac convertible. Although Elsa Schiaparelli usually gets the credit for having discovered zippers, Hermès used them throughout the 1920s for all sorts of sports clothes, luggage, and purses, including the zippered and padlocked precursors of the Bollide and Plume handbags. The famous Hermès scarf, known as a silk carré or square, was launched in an advertisement in December 1936 as a coming attraction of 1937. Called "Jeu des omnibus et dames blanches," its pattern was based on a woodcut of an eighteenth-century game. Hermès scarves of the 1930s tended toward modernist geometric patterns. By designing a large square of silk printed with boldly scaled figural scenes, Hermès invented a whole new genre of fashion accessory, one that maintained its popularity for more than seventy years. Although all sorts of patterns came later-the stable of designs hovered around a thousand in the early 2000s-the typically bold scale of the patterns never wavered, and also influenced the design of high-fashion prints during the late 1980s. Besides the patterns, many based on Hermès's private museum holdings of art and antique objects, what made the scarves instantly recognizable as Hermès products was the quality of the crisp silk twill, woven in Lyons from raw silk from China, and the precision printing. Each scarf design made use of as many as forty-five screens and 75,000 tones, resulting in unparalleled brilliance of color. The first Hermès ties for men were dark, with discreet geometric designs, and made their debut in 1953. After the 1960s Hermès ties were designed by Henri d'Origny. They typically featured small repeated equestrian or sailing-inspired patterns in dazzling colors not usually associated with menswear. 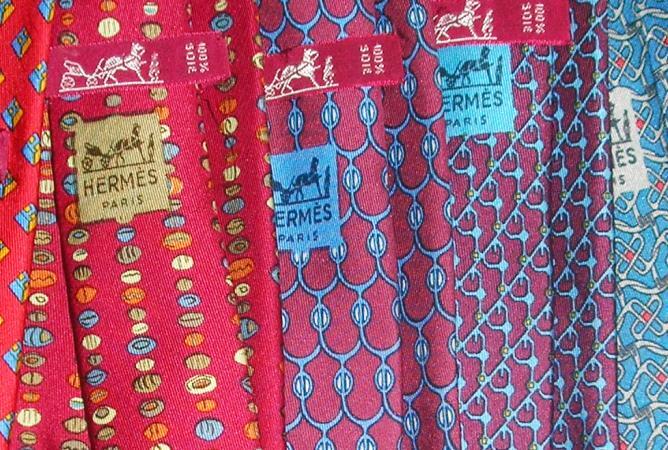 Hermès ties were steadily popular for more than forty years, no small feat in the fickle world of fashion. Appropriately for a firm that can be said to have invented the nonprecious status object, the Hermès box itself became a coveted item, decorating glamorous foyers and boudoirs, and being auctioned off on Internet websites. The box's distinctive color and texture were originally designed to resemble pigskin, one of the most popular sporty materials used for Hermès products of the 1920s and 1930s. At the turn of the twenty-first century, the global brand conglomerates that dominated the market for luxury goods vacillated between emphasizing star designers and brand names. Hermès had offered clothes for sport, both custom-made and ready-to-wear, since the 1920s, but the firm's typical style was better known than the contribution of any particular designer. Since the 1980s, the names of designers associated with Hermès included Eric Bergère and Martin Margiela-whose most lasting contribution may have been an accessory rather than a line of clothing, namely a double-wrapped watch strap. Jean Paul Gaultier, who presented his first collection for Hermès in the fall of 2004, tapped a mien conspicuously lacking from contemporary fashion-the insouciance of the aristocrat born with a good seat. Designs in this mood included fringed cashmere coats fitted like horse blankets that had been thrown around the shoulders and belted, and a leather corset reminiscent of a saddle fastened with the famous Hermès padlock in the style of a chastity belt. See also Celebrities; Jean-Paul Gaultier; Handbags and Purses; Leather and Suede; Martin Margiela; Scarf; Elsa Schiaparelli; Silk. Nadelson, Reggie. "Out of the Box." Departures (May-June 2002): 142-178. Remaury, Bruno, ed. Dictionnaire de la mode au XXe siècle. Paris: Editions du Regard, 1994. Reynolds, C. P. "Hermès." Gourmet, February 1987, 42-122.